Congratulations on completing your CRM implementation! For all the work you've done to date, I have some perhaps sobering news: The work is just beginning. Such a statement may seem a bit daunting given all the work that you and your organization have done to date. You had to sift through the myriad of options and balance the interests of different stakeholders to select a new system. You implemented the new system migrating the constituent data, trained your staff on how to use the new system, and sent your first communications from the system. These are important milestones that should be celebrated. Centralize and Promote Support Documentation. As staff really start using the new system, the step by step guides provided by the vendor or that you developed as part of your organization's documentation will come in handy. Maybe some of your staff developed their own documentation. Centralize these various sources of documentation in one place so the team can access on their own as they use the system. Establish a training calendar. This is the no-brainer recommendation. The introductory training provided by CRM vendor or implementation consultants won't be enough as you get deeper into the system. Furthermore, most good systems see fairly consistent updates that will require consistent training of staff on new functionality. Set up a training calendar with staff. Leverage the training and user support of your vendor. Schedule ongoing check-ins with power users. Before any buyers' regret sets in with staff who are having difficulty making the transition, double down on training and handholding efforts. Schedule regular check-ins with power users to surface the inevitable growing pain problems in the initial use of the new system. If you still have the old system running, shut it down. Old habits are hard to break. Perhaps there was an easier way to run a query in the old system that brings people back into that system. Cut it off. Now. While there are some implementations that require running new and legacy systems for a period of time, once the implementation is complete, shut down the new system. Ideally, the new CRM provided an improvement in your reporting and analytics capabilities, in particular data visualizations in the form of dashboards. It can take some time to figure out how to use these new capabilities and work and what types of data visualizations will be helpful to improving the decision making in how you engage donors and constituents. Prioritize at least one data visualization project in the early going as the visuals are often high impact in telling the story to stakeholders, especially senior leadership. Learning/Testing Environment for New Functionality. Are you ready to test and fail fast? Most organizations have a very deliberate process to get an email or donation request out the door. Keep those processes but set up a testing environment for some of the new functionality. For example, perhaps use new functionality like a Peer 2 Peer fundraising platform or text to give. If you never done either of these before, take a small segment of your file and test the efficacy of the new tools. In testing with small segments, be prepared to fail quickly, learn lessons and then test again. This will likely mean that you need to hasten the operational tempo and that the traditional longer lead times don't apply in a testing/learning environment. Test Content. Now is also a good time to take advantage of new A/B email capabilities to test different messages and content. For example, perhaps you just did a new acquisition from a Care2 or change.org. Take small segments of this list and test different messages and types of requests. What content is generating better responses? Is the content responsive to the daily and weekly events happening in your mission space? Cross-functional Digital Team. To facilitate the development of digital strategy, keep your implementation team in place to serve as a sounding board for new efforts and to work out the operational kinks that inevitably arise when you hasten your operational tempo in a testing/learning environment. This team should be cross-functional involving Development, Communications, Program and IT. Forward looking organizations are smashing traditional silos to build teams around the customer experience. Consider how you might restructure your work to build a solid experience throughout the constituent engagement funnel. Map your business processes. 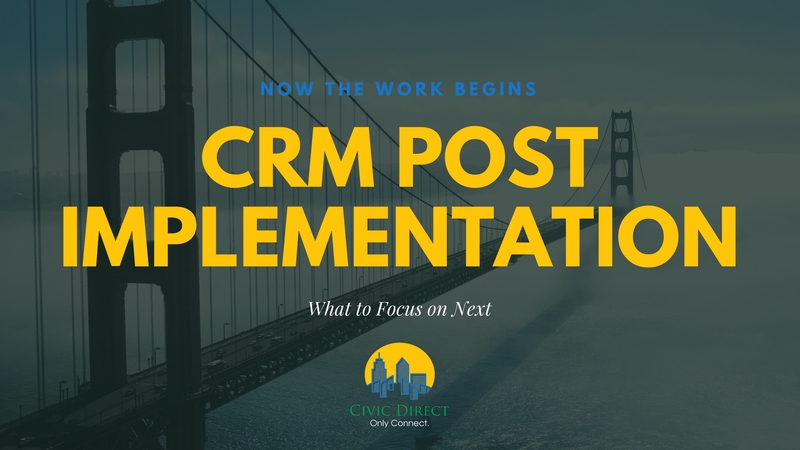 Your team likely identified the various business processes for constituent engagement and fundraising as you began your CRM selection process. Map the workflow of those processes and who has touchpoints to the various tasks. Identify bottlenecks and time-consuming tasks. Consider having staff log time for a few days on various task as it relates to constituent engagement. Determine how best to automate those tasks in the new system. Most systems have mechanisms for automating reporting and report distribution and automated task generation around different parts of the process. Use them. Data standards - If you haven't done so yet, implement standards for data quality. What do you want your major gift officers to log about their interactions? What constitutes a complete constituent record and what's your plan for ensuring that you get that information? De-duping process - If things are going well, you will have a lot of new constituent records coming into the system through organic and paid acquisitions. Use your data standards to minimize duplicate creation and establish a regular process for de-duping and general cleanups. All of these post-implementation activities can be as daunting as the implementation. The overall point is to stick with it. Keep working to get the most of out of your new system in order to grow your base of support and empower those constituents to become advocates to your cause and donors to your mission.